Well maintained, custom built lake front home in Catalpa Cove. Soaring ceilings and oversized windows for natural light throughout. 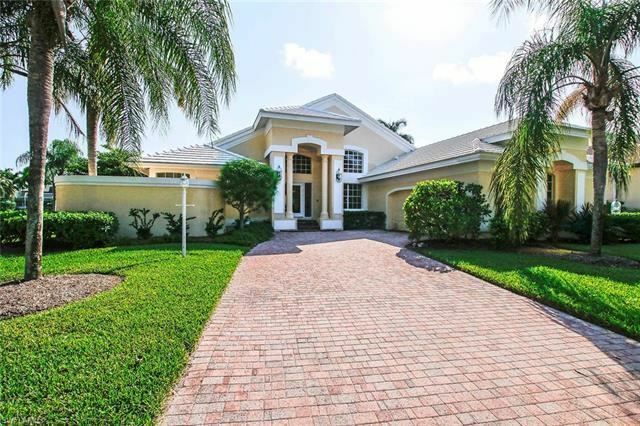 The home features an open floor plan and oversized lanai with lake views. Great for entertaining! Enjoy your morning coffee by the pool or relax in the pool and spa overlooking the lake. The split floor plan features a large master retreat with sitting area, direct access to pool, spacious bathroom with double sinks, shower, separate tub, and generous closet. There are 3 guest bedrooms all with good sized closets and one with an en-suite bathroom. The pool screen cage was installed in 2007 to current code, completely rescreened in 2018. The ac duct work was replaced in 2007, ac unit replaced 2018, Roof replaced to code in 2010, pool heater 2015, hot water heater 2016, extra insulation for energy efficiency, several appliances have been replaced within the last 2 years. Meticulously maintained! Deeded Dock Space #47 with gulf access. Short Drive to the sandy white beaches of Sanibel and Ft. Myers Beach.